A few weeks ago, I gave nonstop tours of Henry Street Settlement (my place of employ) to nearly 200 visitors during Open House New York and, in a moment of insanity, invited my children and their others to dinner that night. 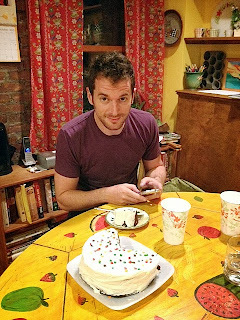 When I arrived home at 6:30, the DH was in the midst of a pasta cooking frenzy, but something was missing -- dessert. 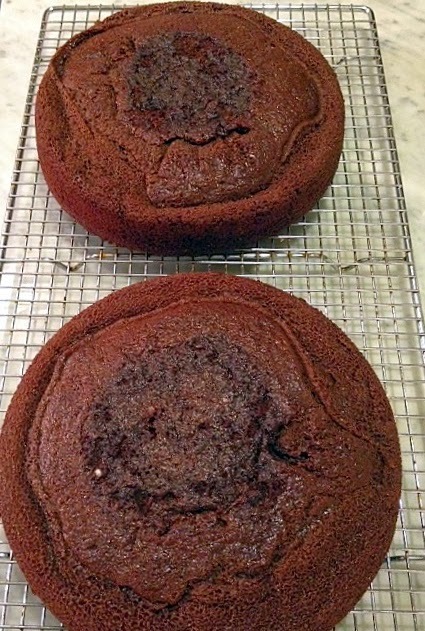 And so, fortified by a cocktail, I decided to whip up a simple chocolate cake I knew would please all. I chose an oil-based (instead of butter) cake because I didn't have time to let the butter come to room temperature. (There's a way to do this in the microwave, but I've never quite mastered that skill.) One sacrifices a bit of flavor when making an oil cake, but the mouth feel, moistness and ease of preparation of these cakes can't be beat. The layers are not gorgeous straight from the oven. That's what frosting is for. 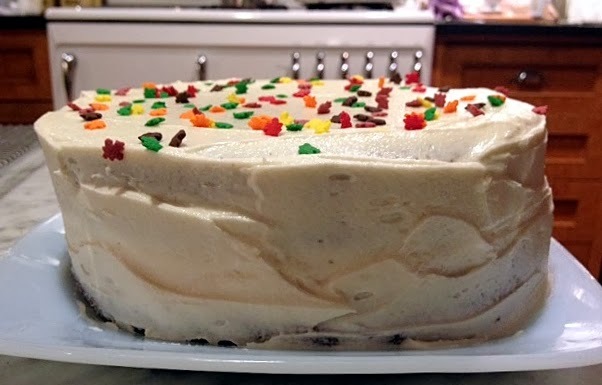 Luckily, I had some vanilla buttercream left over from a previous cake foray, but if you don't, it's not hard to make. Sprinkles add a festive touch. The method on the card (probably from the 1950s) is a bit unclear, but here's what I did. Place the sugar, baking powder, baking soda and flour in a bowl. Set aside. 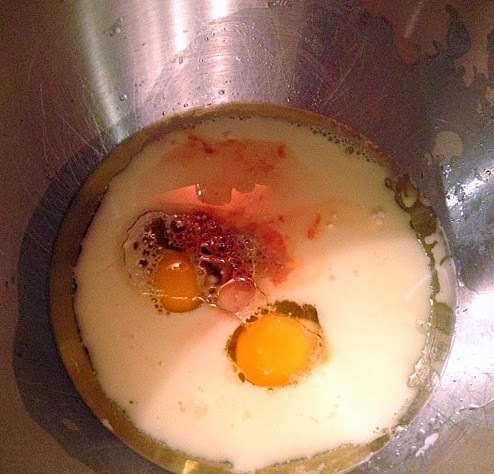 In a mixing bowl, place the oil, eggs, vanilla and milk. Blend. Add the dry ingredients and blend. Add the boiling water and melted chocolate and blend again. Pour into two 9-inch greased and floured baking tins. Bake and frost. Think you meant straight not strait as in "...The layers are not gorgeous strait from the oven. " Love having you as an editor, Allen. That plus the beauty of internet publishing made my error disappear. I promise to make you this very chocolate-y cake! Think you meant straight re ...The layers are not gorgeous strait from the oven. " 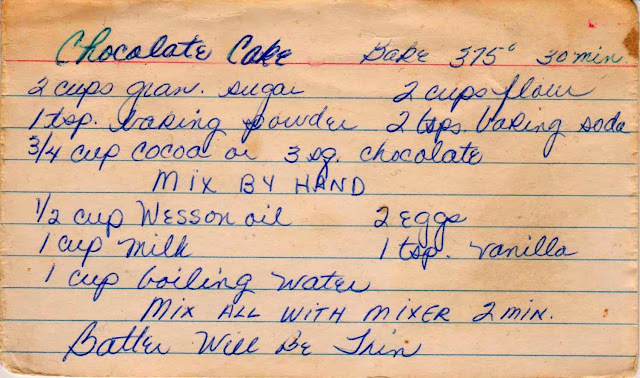 That looks a lot like the recipe for chocolate cake on the back of the Hershey's cocoa can. Right down to the boiling water. 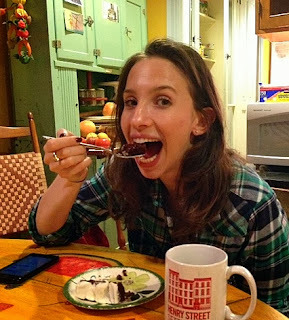 It's my go to chocolate cake recipe. 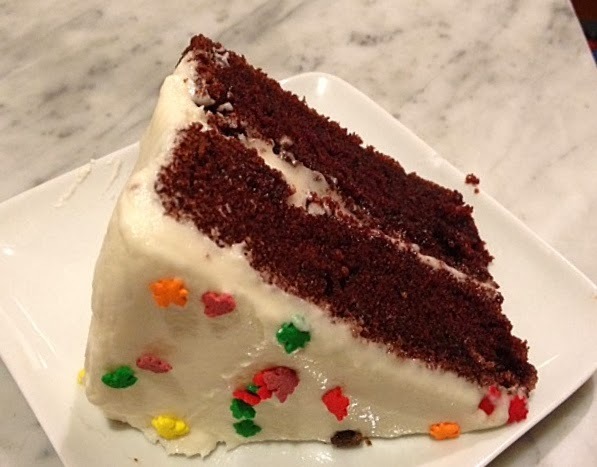 It's fast, moist, nice deep chocolate flavor..a really good basic cake! Thanks, Margi! Except for the recipe card's sub. of chocolate for cocoa, you're right. And so to make things easier, I cut and pasted the Hershey's method and added it at the end of the post. Don't use a microwave to soften butter - either GRATE it on a box grater (this works VERY well) or beat it with a rolling pin. Both methods work well and take a couple of minutes! Thanks for the tip, Alli! Beating it sounds much more fun and less tedious than grating, though!